Bend may not have the same huge population as other Oregon cities like Portland or Salem, but it is still one of the main cultural and commercial hubs of the Beaver State. 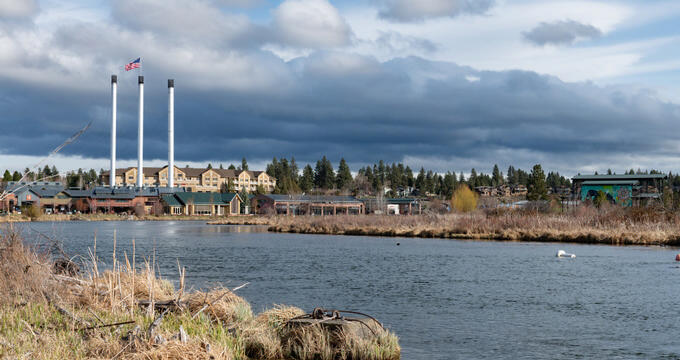 Located in the center of the state in Deschutes County, Bend covers an area of 33.27 square miles and has an estimated population of over 90,000 people, with tens of thousands more in the surrounding metropolitan area. Located not far from the Cascade Range of mountains that stretch out across multiple states and parts of Canada, as well as the Deschutes River, the city of Bend has a lot of history behind it. The name of the town comes from 'Farewell Bend' which was the term given to the Bend area many years ago. Settlers in America took a long time to find the Bend area. Only Native Americans knew of it for many years, until it was discovered by a trapping party in 1824. Various parties and pioneers passed through in the years to follow and the town started to grow with the construction of a sawmill in 1901. Bend, Oregon was then incorporated as a city in 1905 and developed its status as a good logging town, later going on to become more of a touristic and recreational area due to its prime location and diverse surrounding landscapes. In the modern era, Bend attracts nature and outdoor enthusiasts of all kinds, with dozens of activities to enjoy all around the city like cycling, camping, hiking, fishing, kayaking, skiing, rock climbing, and more. The elevation of a city tells us how high it is above mean sea level. Many cities around the United States are located in coastal areas, meaning they have an elevation of 500 feet (152 m) or less, but Bend is some distance inland and located in quite a rocky, mountainous region, so it has a relatively high elevation. The exact elevation of Bend, Oregon is 3,623 feet (1,104.3 m), which is relatively high compared to many major cities in the United States, like New York City, for example, which has an elevation of just 33 feet (10 m). Oregon is the ninth highest state in American in terms of mean elevation. The state has a mean elevation of 3,300 feet (1010 m), so the elevation of Bend, Oregon is very close to the state's average. The highest point in Oregon is Mount Hood, which is found in the Cascade Volcanic Arc in the northern part of the state and has an elevation of 11,249 feet (3429 m), while the lowest point in Oregon is technically the Pacific Ocean, which is at sea level. The highest city in all of Oregon is Lakeview, which has an elevation of 4,802 feet (1,464 m) and is found in Lake County, in the southern part of the state, and is even nicknamed the 'Tallest Town in Oregon'. The elevation of Bend, Oregon, is just a little over a thousand feet lower than Lakeview. When compared to other large cities and towns around Oregon, Bend often tends to have a higher elevation. For example, Oregon’s largest city, Portland has an elevation of only 49 feet (15 m), while Salem has an elevation of only 154 feet (47 m), so the city of Bend, Oregon, is much higher than other major cities around the state. Bend, Oregon has a semi-arid or steppe climate due to its Oregon high desert location. As in many desert areas, the temperatures in the days can vary enormously compared to the nights, so residents and visitors are encouraged to wrap up warm if they want to stay outside in the evenings, even in the summer. The summers have very hot days, while the winters in Bend, Oregon have a mean temperature of around 31°F (-0.5°C), but temperatures can plummet to as low as -10°F (-23°C) during the night time. Precipitation levels are generally quite low in Bend, Oregon. Tourism is a big part of Bend's economy, with the city being a real haven for outdoor enthusiasts and active people of all kinds. The nearby Mount Bachelor ski resort is very popular, while the local Cascade Lakes also offer many different recreational opportunities. Activities like mountain biking, camping, hiking, fishing, rafting, and more can all be enjoyed around the city of Bend. One of the biggest breweries in America, the Deschutes Brewery, is also located in the city, with many other craft breweries around Bend too and the city even having its own Oktoberfest celebrations.